The new 2016 Sea Ray 280 SLX is as forward-looking as a big day boat can be. There is one thing about it that some people won’t like and that’s its beam. At nine feet across the 28 SLX requires a special permit for trailering in many states. That out of the way, the 280 SLX boasts a number of gee-whiz features, some of which are optional, but oh-so cool and worth considering. First, there’s the power tower. At $13,077, it’s not cheap, but it provides an ample amount of shade yet still lets in a lot of sunlight. If that sunlight turns to clouds and a summer shower, the top lowers at the touch of a button and meets up with the windshield to protect occupants from the rain, and any water gathered on the top drains overboard, not in the cockpit. When it’s up, there’s plenty of headroom for even your tallest guests. And just for the record, how big a deal is that extra cost when you’re talking about a boat that has a base MSRP of $132,535 (with one-color hullsides and a 350-horsepower 6.2-liter MerCruiser with a Bravo Three drive). 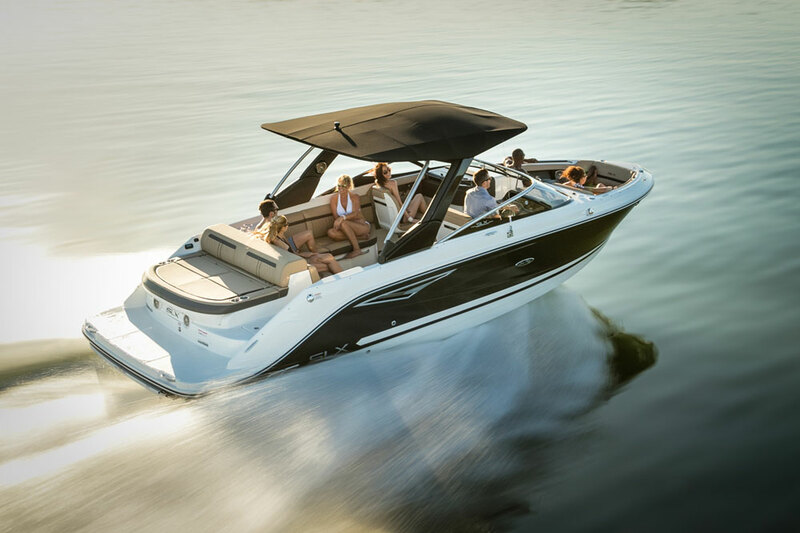 With a standard 6.2L MerCruiser, the 280 SLX has plenty of pep. 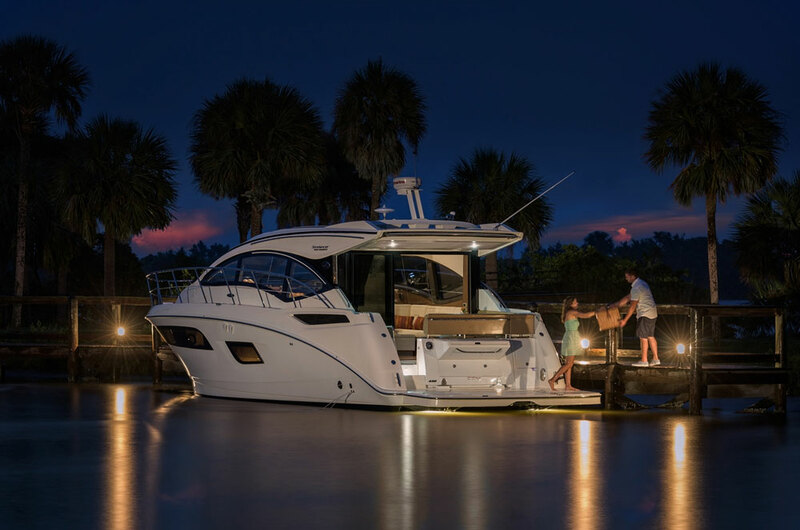 At the helm of the 280 SLX staged at the Miami show, Sea Ray’s new Dynamic Display offered touch-screen controls of all the boat’s systems from the power tower to the bilge pump to the cockpit lighting. That lighting, by the way, extends beyond the interior and to the 280 SLX nameplate on the rear corners of the windshield and the bilge vents on the side of the boat. When they’re on, the boat lights up beautifully. It’s really quite striking. We also liked the stowage system in the bow lounge ahead of the driver. Flip up the backrest and then the cushion to reveal an extra large stowage compartment beneath. It’s a smart design and a great use of space. To port, the 280 includes a head compartment with a standard portable MSD or an optional vacuum-flush system. At the stern, the rear lounge has a nifty feature. The rear sun pad has ratcheting cushions that lift up to create backrests. They operate with one hand, which is often necessary if your other hand is holding a child — or a cocktail. 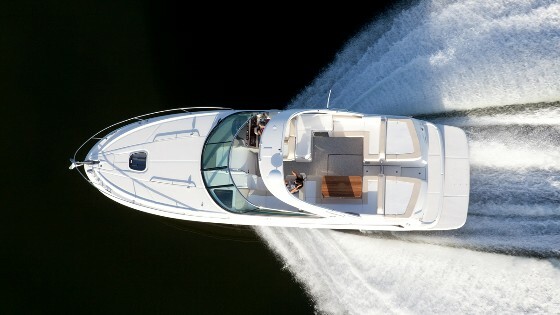 Those are standard as is Sea Ray’s new Quiet Ride system. Quiet Ride uses proprietary materials in the transom that are tuned to cancel out the vibration that occurs naturally in this area and reverberates throughout the boat. Another part of the system includes a material applied to the inside of the hull that turns pounding from the water into heat rather than vibration, which is pretty cool when you think about it. The rest of the system comprises lots of spray foam in interior voids and large foam pads applied to strategic areas inside the hull and deck. 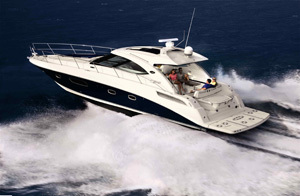 Sea Ray says it reduces noise, vibration, and harshness by up to 50 percent. The quiet lets you enjoy the environment, which is at least part of the draw of boating, right? Aspirational? 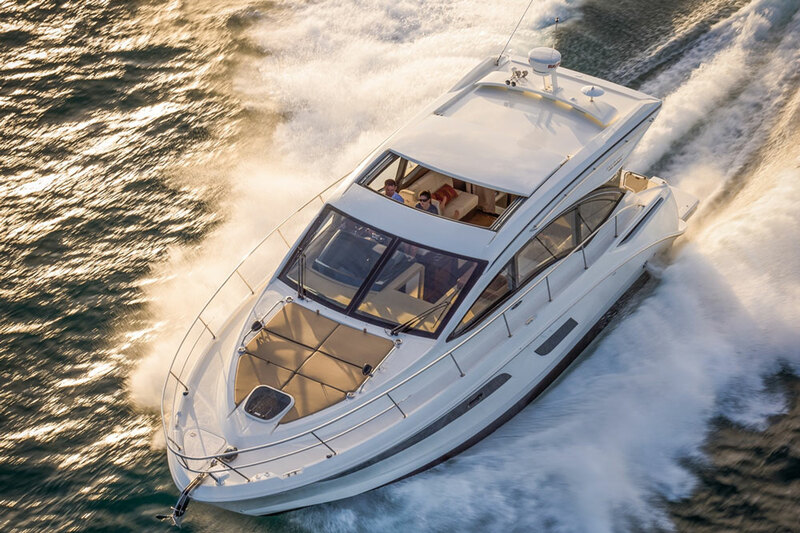 There’s no doubt that the Sea Ray 280 SLX is a model many boaters will dream about owning. It’s always encouraging to see established builders continue to innovate and develop new ideas in the marine industry. 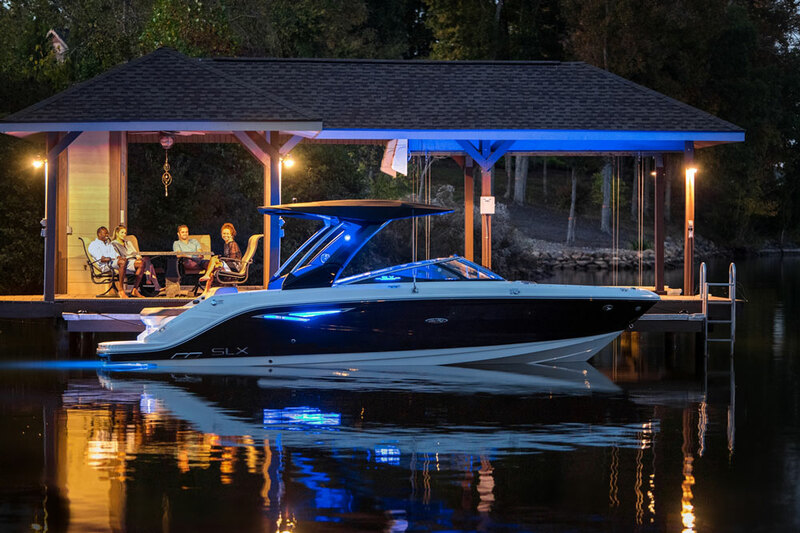 Sea Ray carries that mantle with its new 280 SLX, a forward-looking day boat with some great new technology that actually makes boating better. Other Choices: The Crownline 270 SS is another bowrider boaters will dream about owning. Same goes for the Cobalt R7. 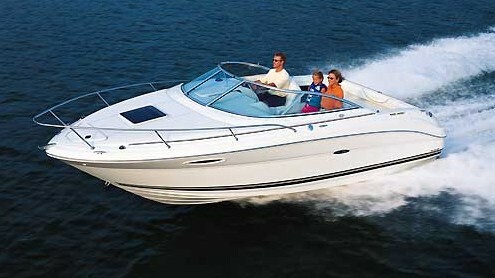 A less expensive option to consider might be the Rinker Captiva 276. 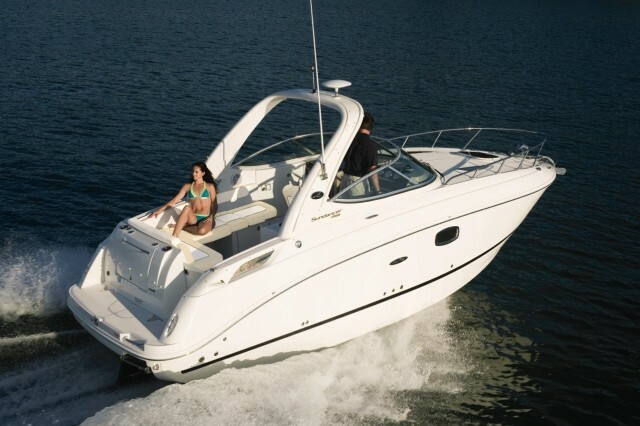 See Sea Ray 280 SLX listings.